Dr. Sakaru Suzuki received his Ph.D. in 1957 from the Nagoya University, Aichi, Japan. He spent a postdoctoral fellowship (1957-1959) in the Department of Pharmacology, Washington University School of Medicine, St. Louis, Missouri. In 1962, he was appointed Professor of Biochemistry in the Department of Chemistry, Nagoya University. In 1989, he moved his laboratory to the Institute for Molecular Science of Medicine, Aichi Medical University, to continue working in the field of proteoglycans, with Dr. Koji Kimata (now Head of the Institute) and many young investigators. Dr. Suzuki is currently a Visiting Professor at this institution and a Science Adviser for the Mizutani Foundation for Glycoscience in Tokyo. From 1960 to 1975, he and his collaborators concentrated on the structure and biosynthesis of glycosaminoglycans, which led to their development of new tools and technologies, e.g., chondroitinase ABC, chondroitinase AC, chondro-4-sulfatase, chondro-6-sulfatase, keratanase, and beta-D-xylosides (chondroitin sulfate-chain primers). Soon after the discovery of hyaluronan in 1934 by Meyer and Palmer, the Meyer laboratory demonstrated that extracts of type 2 pneumococcus (Streptococcus pneumoniae) depolymerize this macromolecule. Following these early observations, a number of investigators noted the presence of hyaluronan-degrading enzymes in microorganisms, including strains of Clostridium, Micrococcus, Streptococcus, Peptococcus, Propionibacterium, Bacteroides,and Streptomyces. Much of the interest in the enzymes of pathogenic bacteria stemmed from their potential usefulness in clarifying what factors were involved in the pathogenesis of infectious diseases. Another feature of the enzymes is their use as reagents in studying the role of hyaluronan in the processes described in this series, e.g.,fertilization, cell differentiation, cell migration, tissue morphogenesis, inflammation, wound healing, and tumor metastasis. Hyaluronan lyases (EC 4.2.2.1) isolated from bacteria and Streptomyces differ from hyaluronidases (hyaluronoglucosaminidases, EC 3.2.1.35) from other sources by their mode of action. They catalyze an elimination reaction, rather than hydrolysis, of the beta1,4-glycosidic linkage between N-acetyl-beta-D-glucosamine and D-glucuronic acid residues in hyaluronan (Fig. 1). This results in the formation of oligosaccharides with unsaturated hexuronic acid residues at their nonreducing ends. This ultraviolet chromophore provides a convenient method for detection of the reaction products. The products can also be tagged through their free reducing groups with either of the fluorescent reporters, 2-aminopyridine or 2-aminoacridone, which makes it possible to separate and quantitate nanogram amounts of saturated mono- and disaccharides (derived from the nonreducing termini) and unsaturated disaccharides (derived from the interior portion) produced by specific lyase digestion of hyaluronan, chondroitin, and chondroitin sulfate chains in a mixture. 1 The separation methods for these mono- and disaccharides include high-performance liquid chromatography and polyacrylamide gel electrophoresis. Fig. 1　Disaccharide repeats of hyaluronan and cleavage with lyase (eliminase) to form unsaturated disaccharides. Thin arrows mark bonds cleaved by the enzyme. To simplify the diagram, the hydroxy groups at positions 2 and 3 of glucuronate (GlcA) and at position 4 of N-acetylglucosamine (GlcNAc) have been omitted. The specificities of hyaluronan lyases are given in Fig. 2. The most specific lyase is the commercially available enzyme prepared from Streptomyces hyalurolyticus. It degrades only hyaluronan and not the other glycosaminoglycans, e.g.,chondroitin, chondroitin 4/6-sulfate, dermatan sulfate, keratan sulfate, heparan sulfate, and heparin.2 Hyaluronan lyases from Streptococcus dysgalactiae and Peptococcus are different from the Streptomyces enzyme in showing weak, but significant, activities toward chondroitin and/or chondroitin 4/6-sulfate chains.3 The third type of hyaluronan lyase is the Arthrobacter enzyme called "chondroitinase AC II Arthro". This enzyme cleaves hyaluronan at the highest rate, and chondroitin and chondroitin 4/6-sulfate at two thirds and one third the rates, respectively.4 The other enzymes termed "chondroitinase ABC" (from Proteus vulgaris NCTC 4636) and "chondroitinase AC-I Flavo" (from Flavobacterium heparinum ATCC 13125) can also act on hyaluronan, but their reaction velocities are far slower than on both chondroitin and chondroitin 4/6-sulfate.5,a Therefore, when analyzing crude glycosaminoglycan samples via lyase digestion, it is advisable to apply complementary techniques to avoid a confusion caused by the differences in specificity of the different lyases. Fig. 2　Specificities of hyaluronan lyases and chondroitinases. A: Relative reaction rates at the indicated pH with chondroitin (yellow bars) or with chondroitin 4/6-sulfate (pink bars) given as percentages of the corresponding rates with hyaluronan (green bars). B: As in A, but the relative rates are given as percentages of the rate with chondroitin 4/6-sulfate. Comparative studies of the hyaluronan lyase preparations from Streptomyces hyalurolyticus(product of Seikagaku Corp.) and group B Streptococcus agalactiae strain 3502 showed that the former acts endolytically on hyaluronan to produce, as end products, a mixture of unsaturated hexa- and tetrasaccharides, whereas the latter initially makes a random cut in a hyaluronan chain and then progresses along the chain, releasing unsaturated disaccharides.7 Interestingly, the group B Streptococcus enzyme also slowly degrades chondroitin sulfate chains isolated after papain and pronase digestion of rat chondrosarcoma aggrecan. The chondroitin sulfate preparation contains approximately five unsulfated disaccharide repeats per chain, and cleavages appear to occur close to the linkage region where at least two unsulfated disaccharide units are clustered (Fig. 3). The highly limited cleavage of chondroitin sulfate chains by this enzyme appears to have great potential usefulness in the structural studies of chondroitin sulfate proteoglycans. It is also reasonable to assume that the ability to cleave the bond near the linkage region may allow the enzyme-producing microorganism to degrade and invade host tissues more effectively. Distribution of the disaccharide repeats, GlcA-GalNAc4S (Di4S) and GlcA-GalNAc (Di0S), along a chondroitin sulfate chain from a chondrosarcoma proteoglycan, and cleavage with group B streptococcal hyaluronan lyase. Letters m, n, and p indicate the numbers of consecutive Di4S repeats occurring in different regions of the chain. U, G, X, and S are the linkage region residues of glucuronic acid, galactose, xylose, and serine, respectively (drawn after Baker et al. 7). Greek alphabet "delta" denotes 4,5-unsaturated structure (see Fig. 1). Partial or complete genes for hyaluronan lyases were cloned from single strains of Streptococcus agalactiae, type 23 Streptococcus pneumoniae, Staphylococcus aureus, and Propionibacterium acnes. Most recently, the streptococcal hyaluronan lyase gene "hylB4755" has been cloned and sequenced completely.8 This gene encodes a 1072-amino acid polypeptide possessing a 30-amino acid signal sequence. Heterologous expression of hylB4755, efficiently driven by its own promoter, produced the undegraded mature form of the enzyme (118 kDa). The hylB4755 protein shows extensive sequence identity to the homologous enzymes encoded by genes from group B Streptococcus (S. agalactiae) strain 3502 and type 23 Streptococcus pneumoniae characterized previously. However, the latter two are incomplete genes truncated at the 5' ends. Interestingly, even an expressed 89-kDa fragment of Streptococcus pneumoniae hyaluronan lyase, the product of incorrect downstream translation initiation, is enzymatically active. It is also noteworthy that the hylB4755 protein contains the His-567 residue, identified in the truncated hylB3502 protein as essential for enzymatic activity. The data are consistent with the early findings that, on photo-oxidation of group A streptococci hyaluluronan lyase in the presence of methylene blue, the amount of histidine destroyed was proportional to the decrease in enzyme activity. Further, reaction of the exoalkylating reagent TPCK with N-3 of the imidazole ring of histidine also caused a decrease in enzyme activity.9 Fig. 4 shows a possible reaction mechanism for hyaluronan lyase, in which a histidine imidazole ring helps abstract the proton at C-5 of the uronic acid moiety. A number of other candidate amino acid residues could act as the general base for completing the abstraction of this proton, but as yet there is no direct evidence for their involvement in the hyaluronan lyase reaction. A possible mechanism for the role of histidine in the reaction between hyaluronan lyase (Enz) and substrate 9. The catalytic base (His) could supply the energy to change the glucuronate moiety (GlcA) into the tautomeric carbeniate intermediate containing the carbon atom with two unshared electrons ( ), which, by splitting of glucosaminidic bond, can be transformed to the stable 4,5-unsaturated structure. The hyaluronan lyase of Staphylococcus aureus strain 1801 and the chondroitin sulfate lyases of Arthrobacter aurescens, Flavobacterium heparinum, and Proteus vulgaris have been purified and crystallized. Of these, crystallographic studies have been reported for chondroitinase AC (Flavobacterium) 10 and chondroitinase B (Flavobacterium). 11 The data indicate that chondroitinase AC is a two-domain protein and that its N-terminal domain (about 300 residues) is composed primarily of alpha-helices (12 in total), which form a doubly-layered horseshoe, while the C-terminal domain (about 370 residues) is built entirely from beta-strands, which form a four-layered beta-sheet sandwich. Fig. 5 (courtesy of Dr. M. Cygler) represents the shape of the enzyme molecule. It shows a large cleft along the side of the N-terminal domain. Within the cleft, there is a high concentration of basic side chains (e.g., His225, Arg288, Arg292, Lys298, and Lys299) (Fig. 5a), which may create a positive potential surface involved in the binding to chondroitin sulfate. In addition, several aromatic residues (e.g., Trp126, Trp127, and Tyr234) within the cleft are well conserved (Fig. 5b) in agreement with earlier biochemical data suggesting the importance of hydrophobic interactions in the enzyme-substrate complex formation for polysaccharide lyase superfamily.10 Chondroitinase B, in contrast, belongs to the beta-helix fold superfamily together with pectate lyases and polygalacturonan hydrolase. 11 More insight into the mechanisms of glycan lyases may be obtained by mutagenesis and crystallographic studies of hyaluronan lyases and related enzymes, and obtaining this information may facilitate further studies of their function and biology. Fig. 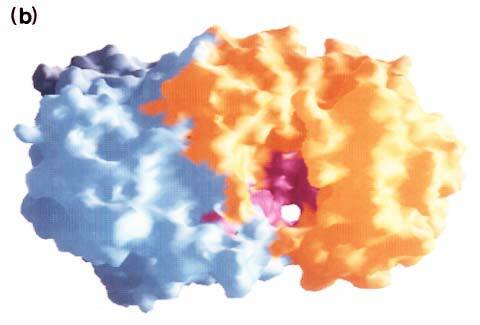 5　Molecular surface representation of chondroitinase AC viewed from the side of the alpha-helical domain (in the plane of the horseshoe) onto the cleft. The alpha-helical domain is on the right, the beta-sheet domain is on the left. (a) The surface is colored according to the electrostatic potential using GRASP10, where red represents negative charges and blue positive charges. The internal surface of the cleft is largely positive with a few small strongly negative area. (b) Distribution of highly conserved residues on the molecular surface. The alpha-helical domain is colored orange, the beta-sheet domain is colored pale blue, and the surface corresponding to highly conserved residues is colored magenta. 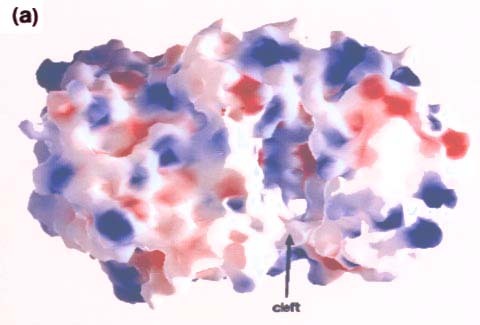 There is a high concentration of such residues within the cleft (courtesy of Dr. M. Cygler, Biotechnology Research Institute, Montrèal, Québec, Canada). Fig. 6　The reaction catalyzed by bacterial "beta-glucuronidase" to form N-acetylglucosamine and alpha-keto acid. Therefore, hyaluronan in the host mucosal layers and in the host diet are probably the significant sources of carbon and energy, particularly for bacteria present in the human colonic microflora. Bacteroides thetaiotaomicron 5482 is one such bacterium. From this wild-type strain a transposon-generated mutant "CS4" was derived which has no ability to grow on hyaluronan or chondroitin 4/6-sulfate, but which retains the ability to grow on unsaturated disaccharides derived from glycosaminoglycans by lyase digestion.13 The CS4 mutation has been mapped to a single gene, "csuF", that encodes a nonenzymatic outer membrane protein. The results suggest that the first step in utilization of hyaluronan and chondroitin sulfates is binding to one or more outer membrane proteins followed by translocation into the periplasm where hyaluronan- and chondroitin-sulfate lyases are present (Fig. 7). Fig. 7　Schematic representation of the cell surface of a gram-negative bacterium. The bacterium has a dual membrane system, in which a periplasmic layer containing cell wall peptidoglycans is located between the inner and outer membranes. The outer membrane is surrounded by an outermost capsule of lipopolysaccharides. In some mucoid strains, a hyaluronan capsule covers the entire cell surface. Glycosaminoglycan-binding proteins (GAG-transporters) span the layers of capsule and periplasm. Glycosaminoglycan lyases (LYS) are in the periplasm, and sulfatases (S) and glycosidases (G) responsible for further degradation of the lyase products are in the cytosol. Much more work remains to do to identify and fully characterize the roles that both bacterial hyaluronan and hyaluronan lyases play in the process of infection of pathogenic bacteria. The availability of the cloned genes of both hyaluronan synthases and hyaluronan lyases will facilitate such studies. The epithelia that line the vast mucosal surfaces of the human gastrointestinal, respiratory, and urogenital tracts serve as delicate interfaces between external environments, rich in microorganisms and pathogens, and internal environments, rich in neuroimmune networks.15 Enhancement of our understanding of microbial hyaluronan capsules and hyaluronan lyases will lead to more effective strategies for understanding the function of this mucosal neuroimmune supersystem, and for developing new genetic, diagnostic, and therapeutic approaches to control these important processes in health and disease. I thank Drs. Vincent C. Hascall, Nobuo Sugiura, and Toshikazu Yada for their helpful suggestions. 1. Plaas AHK, Wong-Palms S, Roughley PJ, Midura RJ, Hascall VC. Chemical and immunological assay of the nonreducing terminal residues of chondroitin sulfate from human aggrecan. J. Biol. Chem. 272: 20603-20610,1997. 2. Ohya T, Kaneko Y. Novel hyaluronidase from Streptomyces. Biochim. Biophys. Acta 198: 607-609, 1970. 3. Tam Y-C, Chan EC. Purification and characterization of hyaluronidase from oral Peptostreptococcus species. Infect. Immun. 47: 508-513, 1985. 4. Hiyama K, Okada S. Crystallization and some properties of chondroitinase from Arthrobacter aurescens. J. Biol. Chem. 250: 1824-1828, 1975. 5. Yamagata T, Saito H, Habuchi O, Suzuki S. Purification and properties of bacterial chondroitinases and chondrosulfatases. J. Biol. Chem. 243: 1523-1535, 1968. 6. Hamai A, Hashimoto N, Mochizuki H, Kato F, Makiguchi Y, Horie K, Suzuki S. Two distinct chondroitin sulfate ABC lyases. An endoeliminase yielding tetrasaccharides and an exoeliminase preferentially acting on oligosaccharides. J. Biol. Chem. 272: 9123-9130, 1997. 7. Baker JR, Yu H, Morrison K, Averett WF, Pritchard DG. Specificity of the hyaluronate lyase of group B Streptococcus toward unsulphated regions of chondroitin sulphate. Biochem. J. 327(Pt1): 65-71, 1997. 8. Gase K, Ozegowski J, Malke H. The Streptococcus agalactiae hylB gene encoding hyaluronate lyase. Completion of the sequence and expression analysis. Biochim. Biophys. Acta 1398: 86-98, 1998. 9. Greiling H, Stuhlsatz HW, Eberhard T, Eberhard A. Studies on the mechanism of hyaluronan lyase action. Connect. Tissue Res. 3: 135-139, 1975. 10. Féhiére J, Eggimann B, Cygler M. Crystal structure of chondroitin AC lyase, a representative of a family of glycosaminoglycan degrading enzymes. J. Mol. Biol. 288: 635-647, 1999. 11. Huang W, Matte A, Li Y, Kim YS, Linhardt RJ, Su H, Cygler M, Crystal structure of chondroitinase B from Flavobacterium heparinum and its complex with a disaccharide product at 1.7 resolution. J. Mol. Biol. 294: 1257-1269, 1999. 12. Linker A, Hoffman P, Meyer K, Sampson P, Korn ED. The formation of unsaturated disaccharides from mucopolysaccharides and their cleavage to alpha-keto acid by bacterial enzyme. J. Biol. Chem. 235: 3061-3065, 1960. 13. Cheng Q, Yu MC, Reeves AR, Salyers AA. Identification and characterization of a Bacteroides gene, csuF, which encodes an outer membrane protein that is essential for growth on chondroitin sulfate. J. Bacteriol. 177: 3721-3727, 1995. 14. Levin JC, Wessels MR. Identification of csrR/csrS, a genetic locus that regulates hyaluronic acid capsule synthesis in group A Streptococcus. Mol. Microbiol. 30: 209-219, 1998. 15. Theoharides TC, Letourneau R, Patra P, Hesse L, Pang X, Boucher W, Mompoint C, Harrington B. Stress-induced rat intestinal mast cell intragranular activation and inhibitory effect of sulfated proteoglycans. Digest. Dis. Sci. 44(8 Suppl): 87S-93S, 1999.